I was challenged to review this book after posting a guide to my ratings system and my fussy/prissy/snobbish standards for evaluating writing that’s offered for sale. A reader and writer whose opinions I respect was highly disappointed by City of Savages and remarked that he’d really like to know my opinion on it. So, I grabbed it from the library. The hardcover is gorgeous, the blurb tempting, and the praise lavish. The book has great hand appeal, and it is being aggressively marketed by a new Science Fiction & Fantasy imprint of Simon & Schuster called Saga Press. It has a ton of favorable reviews. Readers LOVE it. I sold books professionally for 17 years, which means I can spot a “sellable product” from across the shop floor. As a rule, I expect less from them than from a heart-written book. As I read the author bio and noted her lofty pedigree, I was lowering my expectations to the bottom of a well so deep Lassie wouldn’t hear me scream for help. It wasn’t deep enough. Here’s the tl;dr analysis: I can see why this book is so popular, and if I was fourteen and had never read any dystopian or post-apocalyptic books, I would probably not hate it. Even at fourteen I would’ve been bugged by the clunky writing and stupid plot points, so that’s the best I can say. straightforward good vs evil/us vs. them plot cloaked in socially-aware trappings. The book has it all, but so does super-sized plate of nachos with extra cheese, ground beef, sour cream and avocado on top of the salsa and peppers. They’re both ungodly awful messes too, and whether it’s a delicious mess or a disgusting one is wholly dependent on the beholder. I’m not going to get deeply into the tired tropes that are tossed around like confetti. There were too many, from the bad guys being a Red Alliance (absent exotic overlords!) to a world-changing plot-line hinging on personal sexual jealousies, from the “men are oppressive savages, women are civilizing influences even when they’re savage” cliche to the assumption that human tribes always descend to brutality…of them all, the one that bugged me most was the way highly-traditional gender relationship structures were dressed up in edgy clothing. Despite my earlier nachos analogy, I think a more accurate books-are-food description is this: City of Savages is can of nacho-flavored potato snacks. Long before I was done, I had the queasy feeling that tells me I’d eaten something unnatural. Long after finishing it, I still had the lingering bad taste of chemical flavoring in my mouth. This is a thing of empty calories, nasty aftertaste and content so processed that it in no way resembles Real Goodness. It embodies everything right and everything wrong with Big Five publishing in one tidy, beautifully designed package of pressure-cooked prose. It reads like it were manufactured to order by committee. 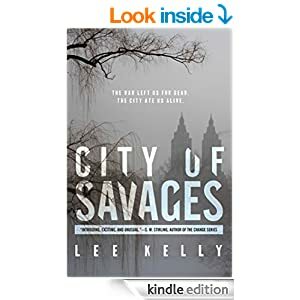 City of Savages offers nothing that I haven’t read before, and I’ve seen the same ideas handled so much better, in so many different ways, that I cannot recommend this example. Sometimes friends rave about a restaurant, I try it and hate it, and then I remember that we look for different things from a restaurant. That’s the case here. Try it, by all means, but if there’s a sequel (and oh, there is so likely to be one, not to mention that it’s tailor-made for a movie-treatment) I won’t be bothering with it.